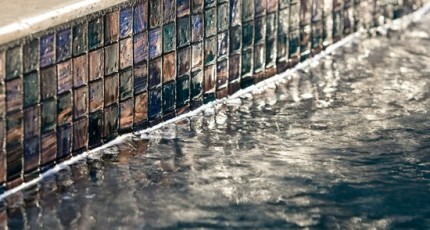 Author Jeff HalperYou definitely want your pool to bring you a relaxed sense of refinement. You may even want it to epitomize your personal sense of luxury. These are reasonable expectations, and very easy to have met or even exceeded, when you approach swimming pool design more than buying just the pool itself, but rather an investment in landscape pool design that creates an outdoor living environment that is both beautified and functionally upgraded by the presence of your pool. Swimming pool design has a great deal to do with your house. It is not only the first landscape element you are most likely to see when you step out into your yard, it is also the last element you see when you look toward your house from the back of your yard. This makes it something of a gateway linking home architecture with landscape architecture. It is very important that your pool and patio aesthetically compliment your home in order to better connect it to the aesthetic of your yard. We always emphasize throughout our site and in every consultation that the house is the focal point of professional Houston landscape design. It makes sense, therefore, to make certain that your swimming pool design first and foremost respect the architecture of your home. Exterior Worlds, with its philosophy of making the house preeminent on the Houston landscape, can be counted on to create a design that will improve the curb appeal of your house rather than diminish it. Swimming pool design is part of your Houston landscaping plan. In landscape design, there are two primary categories of forms: hardscapes and softscapes. Hardscapes are any manmade surfaces where you may walk, stand, or sit. Softscapes are deliberate plantings of vegetation that include everything from decorative grasses to special plantings of trees. Your pool can and should work in harmony with both types of forms. 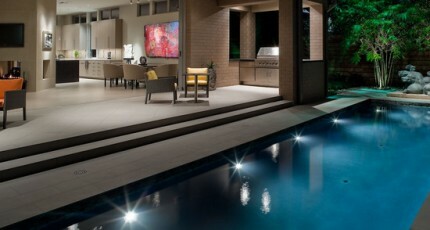 Pool patios are often the finest of hardscapes that you see on a Houston landscape. They can be built of brick, decorative concrete, or stone. All types of decorative patterns can be created from any of these three materials. This allows us to link the aesthetic of the pool patio to other hardscapes in the yard as well as to architectural motifs in your house. We can then plant borders and gardens around the patio that will tie it to other softscape elements in your yard. For example, if we use flowering ground covers as a lawn alternative underneath large shade trees in your yard, we can link your pool area to this ground cover by planting decorative, flowering shrubs around the patio. This has the effect of softening the borders of the patio and better blending them with the organic forms of nature. It is also something that only a professional landscaper knows how to do, because it takes education and training in botanical science to know what plant species will work to create these effects. Swimming pool design should support your personal lifestyle. Along with the many aesthetic concerns intrinsic to pool landscaping, there are just as many lifestyle considerations that need to be taken into account as well. 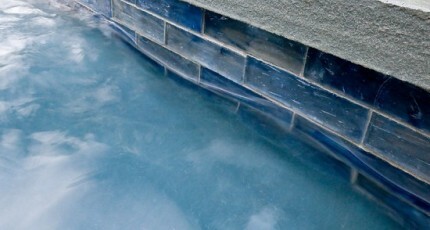 If you like to sit back and enjoy warm streams of underwater current, you may want a spa pool. If you like to gaze into the water and dream, then a reflecting pool orinfinity pool may be more suited to your sensibilities. If you plan to open your pool to large parties where adults and children play in the water, you may want to incorporate features of custom pools such as water jets and waterfalls in your swimming pool design. If you want to serve drinks in an innovative way, a swim-up bar and a cocktail pool will certainly do the trick. If you drink very little, or not at all, and care more for health and exercise, try a lap swimming pool for personal, Olympic style training. Finally, if you think you have a house and yard too small for a pool, think again. Small pools by Exterior Worlds represent a very special form of swimming pool design intended to compliment smaller dwellings and to provide ample patio space for lounging and water volume for a comfortable swim. If you want to add dimension to your yard, consider a sunken pool. You may want a custom swimming pool design that combines elements of several styles of pools in order to support a wide range of personal, eclectic interests. As you can see from these examples, the best pool ideas are based on activities that you like. Different types of swimming pools and pool features tie directly into what you do in and around the water. Exterior Worlds helps you focus all of your expectations, interests, preferences, and pursuits into a final form that you will both enjoy using and love to look at when you relax outdoors.